What would it be like to step in an ordinary room and feel a gentle, computer-generated jungle breeze, with trees swaying nearby that you could touch? AMD, a micro processor manufacturer, is trying to figure that out. The company has been doing a conference circuit in recent weeks promoting its research in heterogeneous system architecture, which is essentially a method to bind parallel computing processes together for greater efficiency. The “holy grail” of these efforts, according to AMD’s Phil Rogers, would be building something like the holodeck — the computer deck on Star Trek (notably in The Next Generation) where characters would play immersive games. They could dial up a mystery novel, for example, then find themselves in a seedy bar with virtual-yet-real-looking holograms in 1940s-style clothing. Rogers, a corporate fellow at AMD, has spent years working in 3-D technologies. It’s only recently that the company felt comfortable enough to speculate about the holodeck, he says. Other entities are also working on holodeck-like technologies, such as Microsoft and Stony Brook University, so perhaps that helped. AMD believes it could be only 10 to 15 years before a holodeck becomes real. What would it take to get there? A better-than-Imax video experience. We hope you’ve had the experience of sitting back in a domed Imax theatre and watching the shuttle launch in Hubble 3-D. Yet despite the awesome wrap-around view, it doesn’t feel like reality. 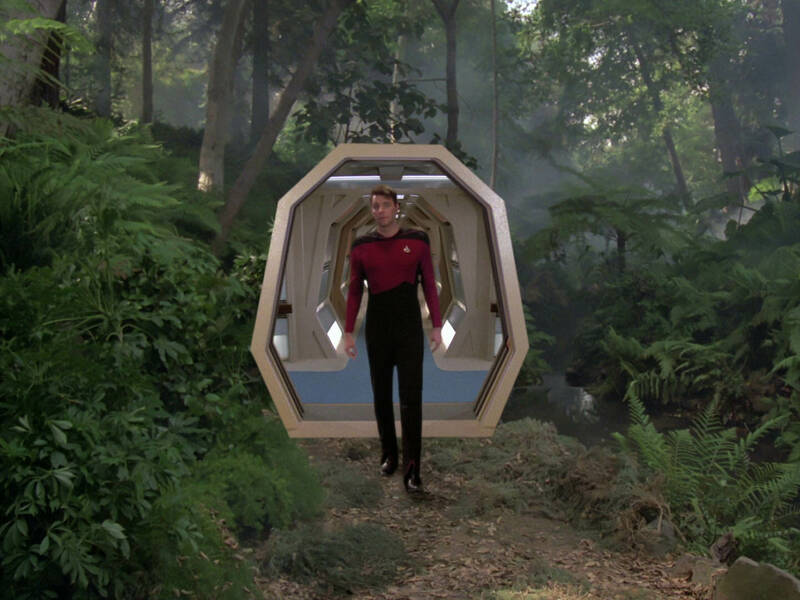 A holodeck would need 360-degree fidelity. It would need to understand that objects get closer when you step towards them, and further when you step away. Perspective must tilt as you move your head. “You inevitably have to combine multiple video feeds to do that and stitch them together seamlessly,” Rogers said. The highest-fidelity audio ever. You know those people who swear that records produce better music than MP3s? “People are very much more fussy about video than audio,” Rogers points out. To make the holodeck feel real, the audio not only has to be immersive, but also directional and able to change as the person moves. The latest in surround-sound technologies doesn’t even close to that, he said. Efficient memory allocation. While the blue screen of death in three dimensions would be rather epic, that’s not what holodeck designers want. The best way to keep the holodeck humming will be sharing memory between the central processing unit and the graphics processing unit, Rogers said. We’ve already made strides in this direction. Still, millions of parallel processes will have to happen simultaneously, so there’s quite a ways to go. Lots of processing power. It will take mega computer juice to sync up the images, audio and other features that make the holodeck real. Remember that line in the movie Apollo 13 when Tom Hanks refers to the impressive computer “in a single room”? It’s laughable now when glancing at an iPhone, but we face a similar challenge now with holodecks. “The problem is it would take racks and racks of mainframe-like computers,” points out Rogers. A holodeck can’t be commercially available until the components fit to a small rack and draw small amounts of power. Find paying customers. Naturally, a holodeck won’t happen without a captive market. We’ve had at least one petition asking the White House to build the Enterprise, but looks like that won’t happen anytime soon. Luckily for humanity, AMD has a backup. The firm believes business conference calls could really use a boost from holodeck-like technologies. Instead of having a talking head and a standard PowerPoint presentation, imagine how much more interesting the report would look if said person could, say, grab a virtual model of the solar system and spin it before your eyes. Target the open-source community. For those people who want to channel their inner Wesley Crusher, AMD plans to leave at least some of the holodeck architecture open to amateur programmers. It’s hard to predict what computer languages will take hold at that time, but it would be the equivalent of letting somebody with C++ or Java experience into the hardware. Perhaps it will let you set your phasers to … whatever you choose.